General Hospital (GH) spoilers tease that Valerie (Brytni Sarpy) will have a lot to mull over. She shared some close moments with Kristina (Lexi Ainsworth) in Tuesday’s episode, which led to surprising kiss. Kristina initiated the lip lock, but something tells us Valerie didn’t exactly hate it. She protested and ran off eventually, but Valerie may just be freaked out over the sudden spark. It’s worth mentioning that this isn’t the first time these friends have kissed. Valerie once planted one on Kristina to make Parker (Ashley Jones) jealous. She was just trying to help Kristina as a pal, but some GH fans pushed for a new pairing. Now it seems like General Hospital could actually make it happen. Valerie let her walls down with Kristina as she talked about being isolated when she was younger. She mentioned things getting weird with her only female friend, so GH could be implying that growing feelings got in the way. Regardless, this friendship is perhaps getting a bit too deep for friendship. You can bet there’s going to be some tension until Valerie can make sense of what she really wants. 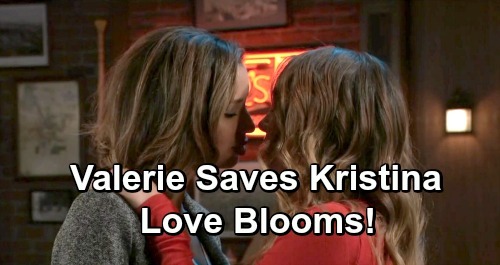 Of course, there was another reason for Kristina’s kissing blunder. It pushed her closer to Daisy (Kelsey Wang) and will lead her further down the cult path. Kristina feels like she screwed up big time with her best friend, so she’ll come to rely on her new friends more and more. That could certainly pull Valerie into this shocking storyline. Kristina had already become distant due to her DOD activities. She stays busy with volunteer work and group meetings, so she hasn’t had much time for Valerie. Kristina will probably have even less time now that she’s created awkwardness. She’ll probably just throw herself into the cult to keep her mind off what she’s lost. Whether Valerie’s willing to return Kristina’s feelings or not, she may want to reach out and fix this at some point. That could set up a cult visit and a shocking realization. Kristina may be fooled by this crew, but this detective probably won’t be. Valerie may realize Kristina’s in over her head and needs some help getting out of this mess. Naturally, Kristina will be in denial about the reality of the situation. It may take some work to convince her, but Valerie would fight hard. Maybe General Hospital intends to let love bloom in the process. Valerie probably wouldn’t have been so panicky over that kiss if it didn’t mean something. GH might be gearing up for a new couple, so we’ll see how it all pans out. General Hospital spoilers say some exciting material’s coming up, so don’t miss all the shockers. We’ll give you updates as other GH news emerges. Stick with the ABC soap and don’t forget to check CDL often for the latest General Hospital spoilers, updates and news. General Hospital Spoilers: Sasha Pulled Toward Ryan’s Deadly Path – Kiki Dies Defending New Sister?